A lot of people never even notice, but yes, I voluntarily let someone stick some needles and ink into my body. My tattoos are a part of me, and I absolutely have no regrets or whatsoever. They’re also not very noticeable because they’re pretty small and in places you don’t always see or look at. That’s why not everyone notices that I have them, and when someone actually does, they ask me what it means. I get this a lot with the tattoo on my right wrist, as it’s the most noticeable one, especially in summer when I wear t-shirts (Sitting here, writing this in a sweater. Yay for Belgian summer!). But I always fail to explain what it actually means to me, because it’s quite personal. Not that I care about people knowing why, but it’s difficult to understand. If you’ve read my post about mental health, you already know that I’ve been through some struggles before. When I was around 18 years old, I definitely wasn’t feeling too good. I’ve always been the kind of person that tries to please everybody. I would go out of my way to do things for people that didn’t even appreciate it. I would put myself in second place in each and every situation, only to get taken advantage of. Aside from that, I’ve also always been kind of afraid of being judged. For the biggest part of my life, I was what you call a wallflower. I never wanted to be noticed, because when you get attention, that could turn into a bad thing. I was so afraid of judgement and criticism, that I would hide my interests, creativity… I would hide everything that I am. I guess you can understand that I felt pretty miserable. So why the tattoo? One of my biggest dreams since being a little munchkin, was going to New York City. Every time the 7-year old me would see the Statue Of Liberty appear in a movie, he’d pee his pants a bit. I didn’t only want to go there, I wanted to experience and be everything that is New York. But it always kind of stayed a dream, because obviously it’s not the cheapest trip you’ll ever make. So flash-forward to that miserable boy, many years later, who felt like the world was crushing down on him. That boy was sick and tired of everything, and felt like it was time to do something for himself. I didn’t care about how I’d do it, but I HAD to travel to the Big Apple that same year. That’s the deal that I made with myself. And as stubborn as I am, I pushed through and made it happen. So on december 23rd 2014, miserable me stepped foot on a plane to the United States, and that person never returned. It became my journey to freedom. So long story short, what does my tattoo stand for? It stands for my liberation. It stands for a point in my life where I finally decided that I deserved to be my own person. It stands for that moment where I freed myself of everything that held me captive. 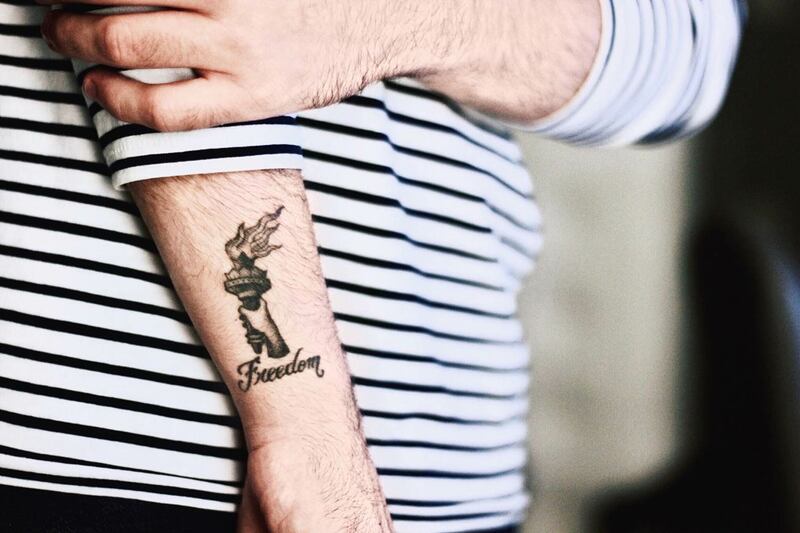 Because in that moment, in a dark tattoo-shop somewhere in Lower Manhattan, I felt free.